As is known, the atmosphere surrounding the Earth consists of many layers. Each layer has many important duties for the benefit of living beings on Earth. When the atmosphere is analyzed, it has been discovered that each layer has the function of sending the materials or rays they are exposed to back into space or back down to the Earth. Now let us examine the returning function of the layers of atmosphere with some examples. For example, the troposphere, 13 to 15 kilometers above the Earth, enables water vapour to rise from the surface of the Earth to be condensed and turn back as rain. The ozone layer, the lower layer of stratosphere at an altitude of 25 kilometers, reflects harmful radiation and ultraviolet light coming from space and sends them back into space. The ionosphere reflects radio waves broadcast from the Earth back down to different parts of the world just like a satellite, making wireless communication, radio, and television broadcasting possible over long distances. The magnetosphere layer sends the harmful radioactive particles emitted by the Sun and other stars back into space before they reach the Earth. Now, let us ask the following question: What does the statement of the Qur’an that was revealed 1400 years ago concerning the functions of sky layers which have been discovered in the recent past mean? Could this be explained by anything other than the fact that the Qur’an is the word of Allah? 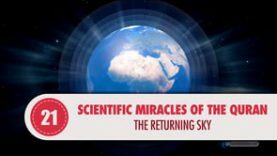 “The returning back” function of sky has recently been discovered. It is impossible for a sane person to accept that a human being especially an illiterate individual who lived 1400 years ago to have this knowledge. If the Qur’an is not accepted as the word of Allah, it is necessary for us to accept that a person who lived 1400 ago observed the sky with electro telescopes and acquired this knowledge. Someone who accepts this could not be regarded as sane and a human.